Agency Component data, submitted by all agencies, on their policies and practices. Case Component data on client characteristics, services, and perpetrator characteristics, provided by agencies that have report-level tracking systems. Key Indicators Component data consisting of aggregated data on key statistics of investigations and victims, provided by agencies that do not have report-level tracking systems or are unable to provide case-level data. From January through May 2015, nine states--Colorado, Georgia, Illinois, Maine, Massachusetts (Disabled Persons Protection Commission), Missouri, Montana, Pennsylvania, and Texas--participated in a pilot of the data system and submitted the Agency Component and either the Key Indicators Component or the Case Component data. 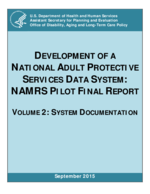 This report (Volume 1) consists of a description of the NAMRS Pilot, findings from the piloting process, and recommendations for the future NAMRS.